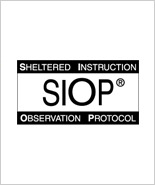 Pearson’s SIOP® Institutes were designed by the original SIOP® Model authors to help educators learn the SIOP Model and effective implementation practices. Pearson Institutes provide professional development at a regional location, featuring face-to-face instruction by certified experts and authors. Educators participate in high-quality training on research-based strategies and interact with authors, field experts, and colleagues who are facing similar instructional challenges.